Saturday night Vespers on the campus broke the mission’s attendance record for an evening service. Hieromonk David Edwards of the Monastery of Saint Silouan the Athonite served with the bishop presiding. Father David serves as the Mission’s priest and spiritual leader. More people joined the worshippers for Bishop Michael's lecture, “Are you saved? An Orthodox Perspective.” Bishop Michael answered probing questions from Orthodox and non-Orthodox members of the audience both formally and also during the reception that followed. The assembly for Sunday morning liturgy also was the greatest ever for the mission parish. In his homily Bishop Michael spoke of the mission as a body rather than as a congregation and encouraged people to "tell their story" regarding Christ and the Church in their lives to those who are unbelievers or are un-churched in order to bring them to the faith. He prayed for their growth in God's love. At the conclusion of the liturgy Bishop Michael presented the mission with an antimension ~ the essential cloth on which a liturgy is celebrated. A bountiful lunch and stimulating fellowship followed during which Bishop Michael spent several hours getting to know the mission and answering many questions, including those about his vision for the future of the parish. He proposed that the mission host a miracle-working icon or saint's relic later this year in conjunction with a healing service open to anyone of any faith. 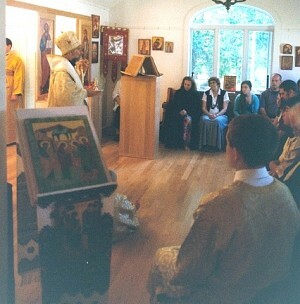 The mission conducts services either on the SUNY Potsdam campus or in a private chapel in Potsdam. Generally, there are 15-20 worshippers on Sunday. BUFFALO & ROCHESTER NY: Parishes Join for "Family Day"